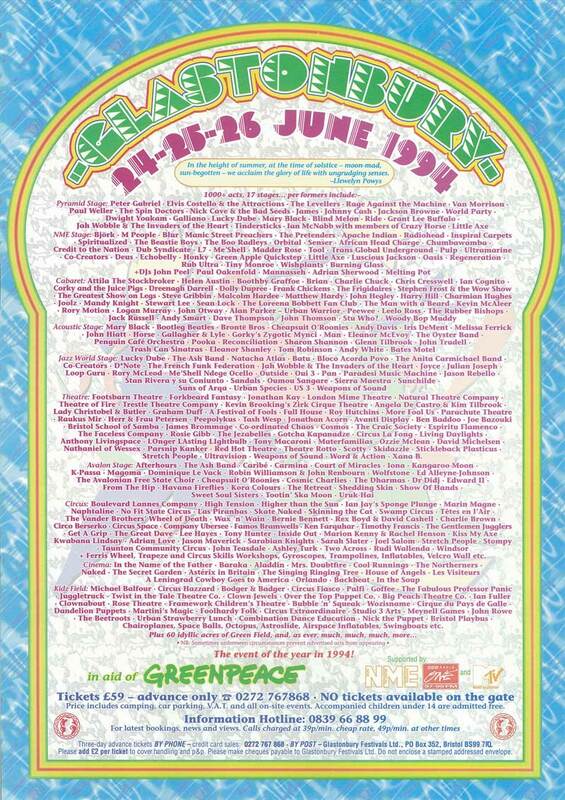 On 13 June 1994 the famous Pyramid stage burnt down in the early hours of the morning but luckily a replacement was provided by the local company who also provided the stages for the NME and Jazz stages. It was also the first appearance of the wind turbine beside the main stage providing 150 kw of power for the main stage area. Channel 4 televised the event live over the weekend and it increased the appeal of the Festival to a wider audience. On the Saturday night there was a shooting incident involving five people but no one was badly hurt. But there was the first death in the Festivals history when a young man was found dead from a drugs overdose. £150,000 was donated to Greenpeace, £50,000 to Oxfam and some £100,000 to local charities and good causes. Attendance: 80,000. Tickets: £59. Programme price: £5.